SCBWI's INSIDE STORY is this weekend, Nov 2 and 3, 2013! 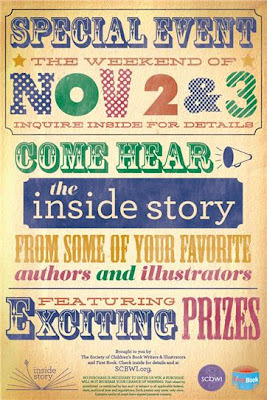 SCBWI, in conjunction with First Book, is launching its first international "Inside Story" event at select independent bookstores this November. The pilot program will launch in ten cities. It has two purposes: to provide an opportunity for young readers, teachers, librarians, and children's book lovers to become acquainted with new releases, and to build traffic and sales for independent bookstores. A group of authors and illustrators will have a brief time to share the "inside story" behind their 2012 or 2013 publications and support independent bookstores. 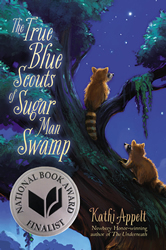 SCBWI will provide publicity, volunteers for the day of the event, and special prizes to help bring in patrons, including a drawing to win a phone call from a famous author and a grand prize drawing across all bookstores to have a character in a new Almost Identical book by Lin Oliver named after them. 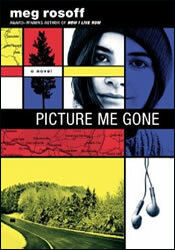 In addition, First Book will donate a book to a child in need for every book purchased at an SCBWI Inside Story event. If you're lucky enough to be geographically close to one of the participating bookstores, make sure to check out Inside Story this weekend! 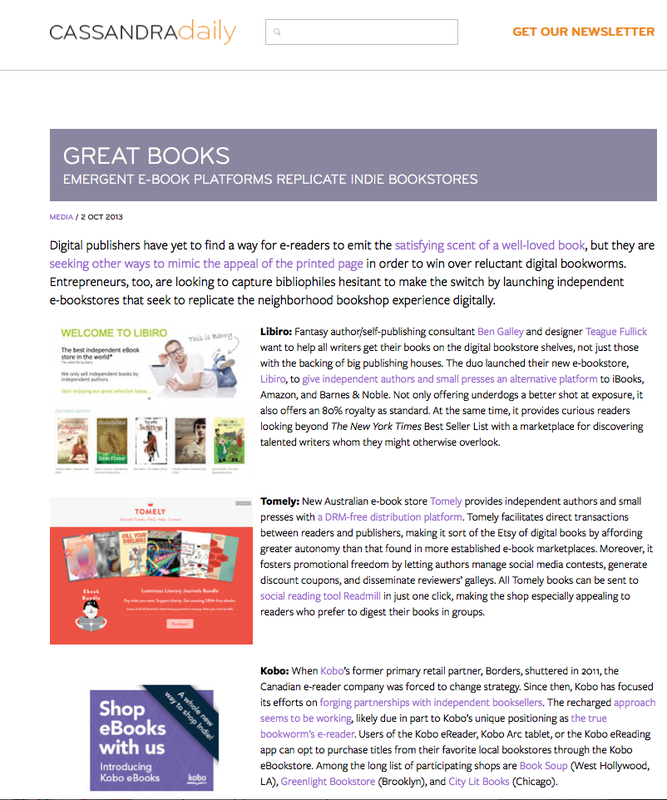 Have You Heard Of The Independent E-Book Stores? Disclaimer: The following history of book selling in physical stores is super-simplified to share my thought process. In the "golden age" of Independent Book Stores, that's where you went to buy books. Then Barnes & Noble and Borders kind of took over the selling of books, and then Amazon took over from them. Independent bookstores still exist, though they're fewer in number. And they still serve an important function - curating selections is becoming more and more crucial as self-published work ups the amount of books available. However you look at it, things have changed dramatically. In the much newer realm of e-bookstores, We've pretty much started with the big platforms: iBooks, Amazon and Barnes & Noble. Libiro: Fantasy author/self-publishing consultant Ben Galley and designer Teague Fullick want to help all writers get their books on the digital bookstore shelves, not just those with the backing of big publishing houses. Not only offering underdogs a better shot at exposure, Libiro also offers an 80% royalty as standard. Tomely: New Australian e-book store Tomely provides independent authors and small presses with a DRM-free distribution platform. 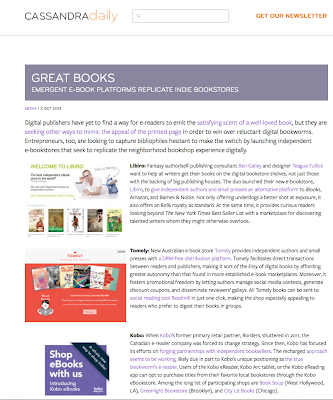 Tomely sees itself as sort of the Etsy of digital books, and all their titles can be sent to social reading tool Readmill in just one click, especially appealing to readers who prefer to digest their books in groups. Kobo: When Kobo’s former primary retail partner, Borders, shuttered in 2011, the Canadian e-reader company was forced to change strategy, focusing on forging partnerships with independent booksellers. They see themselves as "the true bookworm’s e-reader." Users of the Kobo eReader, Kobo Arc tablet, or the Kobo eReading app can opt to purchase titles from their favorite local bookstores through the Kobo eBookstore. Among the long list of participating shops are Book Soup (West Hollywood, LA), Greenlight Bookstore (Brooklyn), and City Lit Books (Chicago). It will be fascinating to see what happens in the future with indie e-bookstores and e-book sales. It's our new state of the art website! And when I say our - it's ours - yours, mine, everyone who is part of the community that is SCBWI. Go ahead - you can Ohh and Ahh! over the cleaner, easier-to-navigate design! 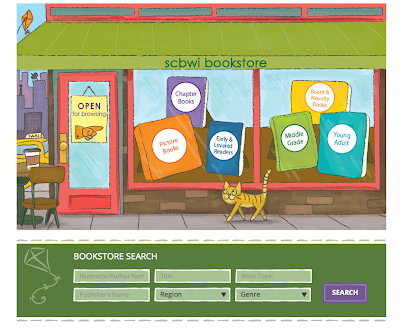 All SCBWI events will now appear on a central searchable calendar, which means you have access to information about SCBWI events around the world. The new website also now hosts all the regional websites, so connecting with your local activities is just a click away. 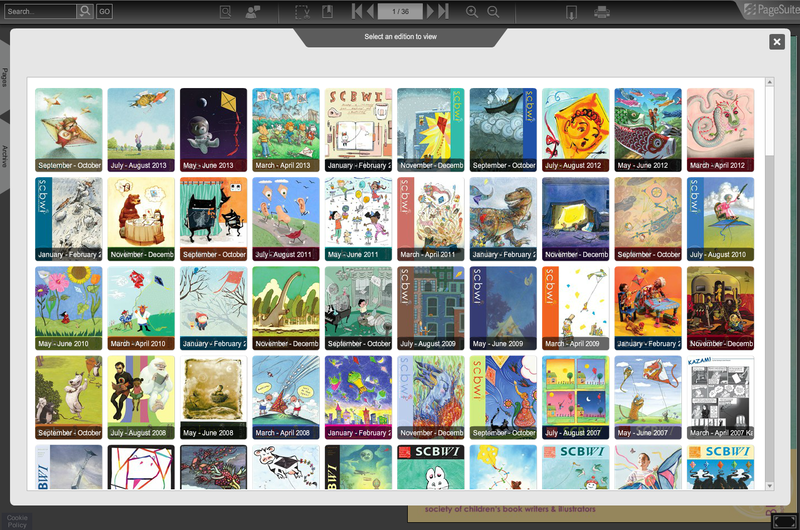 The world of SCBWI is just a click away! The Discussion Boards + Verla Kay's Blue Boards = An Awesome Community-Wide Discussion! Those of you who use our Discussion Boards are probably already aware that we have merged with Verla Kay’s Blue Boards and brought aboard her team of knowledgeable moderators and the large community that is part of the Blue Boards. If you have not visited the Boards in a while, we think you will be pleasantly surprised with the active, vocal, helpful community that exists there. You’ll want to join in the conversation. New to the site is an online bookstore where both PAL and FULL (i.e., independently published) members can post their books for sale, including synopses, book trailers and reviews. The store will be linked directly for sales to Indie Bound, Barnes and Noble, Amazon or to your own website. The SCBWI will heavily promote our bookstore to drive traffic to the site, so that it will become an important option for anyone looking to buy children’s books. For those of you who are independently published and have sought alternative means of selling your books, our online bookstore will meet your needs. And for those who are traditionally published and distributed, it will provide one more place where both your in-print and out-of-print work can be discovered. 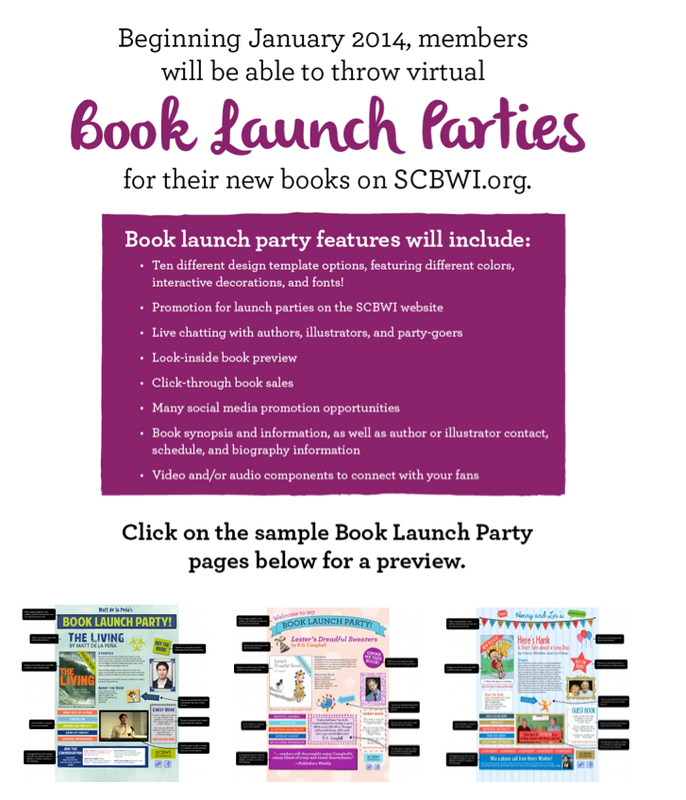 Four times a year, beginning in March 2014, members with books (both those published traditionally and independently) debuting during the calendar year will be able to host a virtual Launch Party. Members will have access to attractive, professionally designed templates from us to help you design and build your Launch Party page—or go wild and design your own. It’s your party! There will be room for visuals, videos, reviews, a guestbook, and a message from the author. We will publicize the book launch party date both with our membership and with the community at large, reaching out to publishers, educational institutions and organizations, and the general book buying public. In these times when drawing attention to your work is so challenging, the SCBWI Book Launch Party will become a quarterly special event. Your book launch page will stay posted until the next launch party, and then will be archived for one year. Launches will require a $25 charge to cover design and promotion. Our new and improved Speakers Bureau is now open to all members (both PAL members and Full members) who have published a book for children. Members can post information about speaking, along with a sample video if you desire, and teachers, librarians and organizations will now be able to search for speakers in a variety of ways including by book title, zip code, Skype availability, and grade level. We are planning several new outreach programs to publicize the Speakers Bureau, to help people find you. All members, whether published or pre-published, are eligible to list their blog in our blog roll. 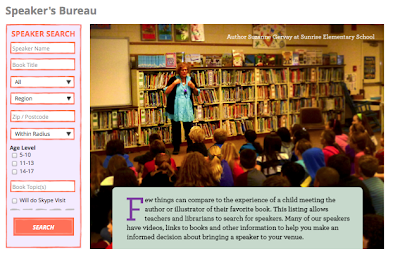 Those seeking to reach blogs about children’s books will have a centralized table of contents where they can find your blog. In addition, each month we will select from this listing ten member blogs to feature on our homepage. It’s a huge opportunity to drive traffic to your blog. New and Improved Illustrator Gallery! We drew on a panel of art directors, agents, and illustrators to make our Illustrator Gallery entirely searchable and user friendly. Illustrators who list in our gallery can be searched based on genre, style, keyword, name, or region. Make sure to tag your images with keywords and genre descriptions to take advantage of the new search capabilities. Many illustrators find work through our Illustrator Gallery, and the opportunities for your work to be discovered are now tremendously improved. After years of work, the Bulletin Archive has been completed after a comprehensive scanning. 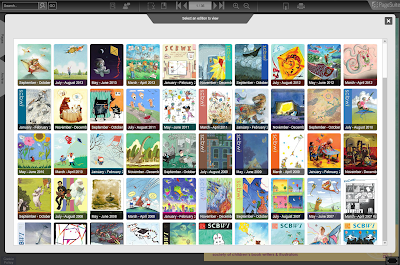 Two hundred and fifty issues of SCBWI’s bi-monthly Bulletin, representing forty-two years of articles and advice, are now easily searchable by keyword. We doubt there is any other resource currently on the web that contains this much information on the field of children’s books. SCBWI is in production on regular thirty to forty-five minute podcasts, with interviews from leaders in our field—from editors and art directors to authors and illustrators. The first four podcasts are currently being released, and will be available for free download to SCBWI members. One podcast per month will follow. This is an amazing and free benefit to being an SCBWI member. SCBWI will be producing three video intensives per year, with more to follow. These intensives will focus on timely and much needed topics and will be available to all members, especially those of you who are not able to travel to conferences that feature intensives. We want to make the best instruction and information available to all our members. So go check out the new scbwi.org, update your profile, and make it your connection to the worldwide community that is the Society of Children's Book Writers and Illustrators. Your tribe. Huge cheers of thanks to Sarah Baker, Chelsea Confalone, Sally Crock and Josh Smith at the SCBWI Main Office for making this new website - that's been nearly two years in the making - the sparkling reality it is today! Jeremy Johnson Johnson’s life has begun to feel like a cruel fairy tale. He hears voices – “strange whisperings” – so the citizens of the small town of Never Better treat him like an oddity and an outcast. Meanwhile, his mother takes a bite of a cake so delicious it’s rumored to be bewitched and runs away with another man. 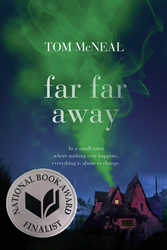 Jeremy’s heartsick father goes into his room and stays there unhappily ever after. Then the town’s coltish, copper-haired beauty takes a bite of the cake herself and falls in love with the first person she sees: Jeremy. In any other place, this would be a turn for the better for Jeremy, but not in Never Better, where the Finder of Occasions—whose identity and evil intentions nobody knows—is watching and waiting, waiting and watching. 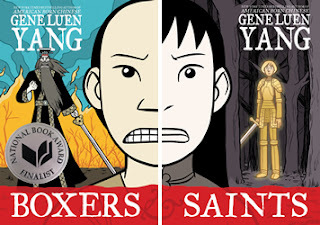 . .
and Gene Luen Yang for the graphic novel “Boxers & Saints” (First Second). The winner will be announced in a ceremony in New York City on November 20, 2013. To find out more about the National Book Awards, you can check out The National Book Foundation's website here. We all have some wonderful reading ahead of us! 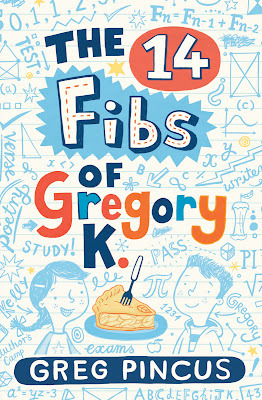 As my friend, social media guru, and frequent SCBWI Conference Faculty member Greg Pincus' book launch party (for his "The 14 Fibs of Gregory K.") draws near (it's this Saturday, October 19, 2013), I asked Greg to share what he's up to marketing-wise, because it's pretty cool. I knew when I set up my book launch at the Flintridge Bookstore here in the greater Los Angeles area that the event would be a lot of fun... but, of course, not everyone who wanted to be part of the celebration would be able to make it. Besides the fact that there's never a perfect time when everyone is free, the truth is that because of social media, having lived on both coasts, and meeting people at conferences and the like, I have friends and family (and I think even fans!) all over the globe. So, I decided to make my launch a live online event, too, so that everyone could get a chance to celebrate together. The Flintridge Bookstore also put together a way on their website for folks to order a copy of my book - and leave instructions for who to personalize it to. This way, people can order now or even during the launch party itself and be part of the event that way. The store will continue to let people order signed books from me after the launch, and if the personalizing thing is a big success, we hope to keep that going, too. The challenge in all this is that it's technology and internet based and, well, anything could happen as the event draws near. Still, the tech I'm using is Google+'s Hangouts on Air (yay, social media! ), and Google tends to be pretty reliable. In fact, one way to watch the event live is on my channel on Google-owned YouTube: it'll be streaming live from 3-5 Pacific time on Saturday, October 19th here. The live event should (tech-willing!) also be available at my blog Gottabook at the same time. I'll keep updating news at my blog and at the Facebook event I set up to let people know about the party. Watching should be easy, no matter where you do it. It was fun to create something where all my friends (online and offline) could actually participate. Obviously, it's still not that perfect time when everyone's free... and some of the in-person fun (like PIE!) won't translate online... but there are so many people who've been part of my journey that having a chance to celebrate with them makes the possible hiccups seem pretty insignificant. 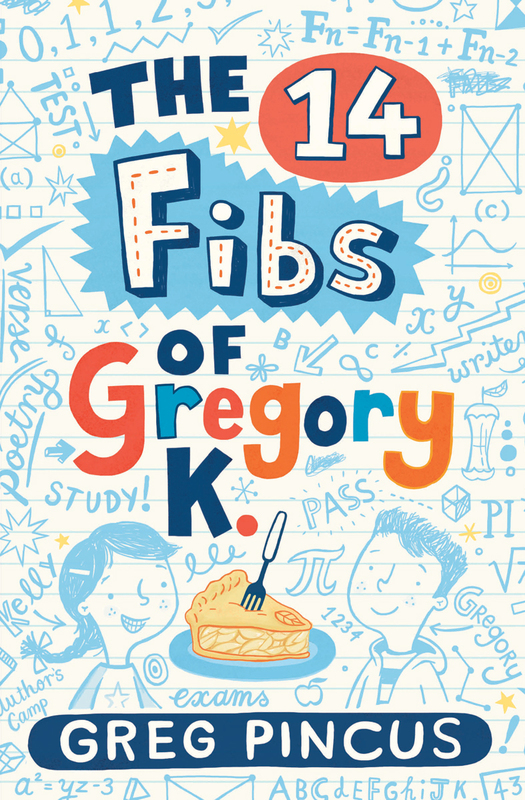 You can find out more about Greg and THE 14 FIBS OF GREGORY K. and the launch - and how it all goes - at his blog Gottabook. We'll be tweeting the conference with the hashtag #ny14scbwi and blogging about it at the official scbwi conference blog. 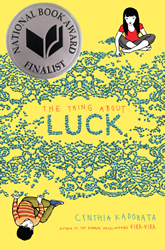 We know reading is good for you, good for kids, good for teens, good for everyone. 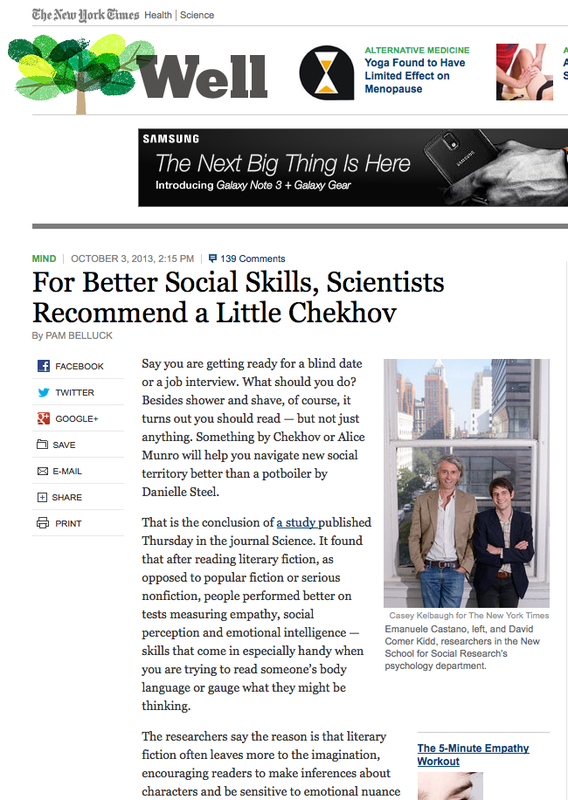 And now, maybe we need to add Social Skills as a benefit of reading as well. "It found that after reading literary fiction, as opposed to popular fiction or serious nonfiction, people performed better on tests measuring empathy, social perception and emotional intelligence — skills that come in especially handy when you are trying to read someone’s body language or gauge what they might be thinking." The parsing out of what kinds of books were beneficial to read and the guesses as to why ranged from interesting to, well, elitist. 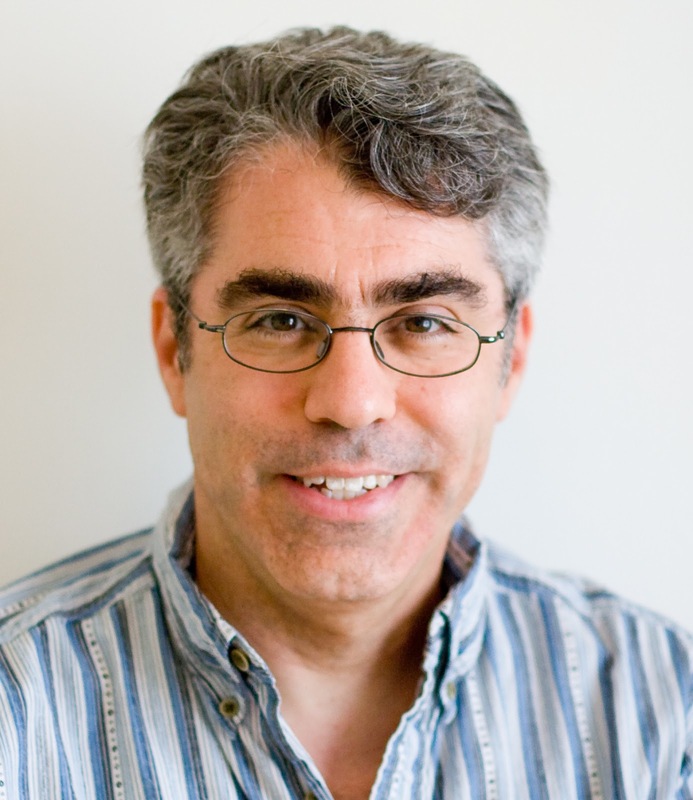 Are the findings ammunition for teachers who want to teach "literary fiction?" Does it hurt those of us who write everything else? How does this fit in with the new Common Core? And does this even apply to children and teens, and to kids' and teen books? There are so many questions this study brings up. Emanuele Castano and David Comer Kidd, researchers in the New School for Social Research’s psychology department, are continuing to research the connection between reading and emotional intelligence. They're even asking for volunteers here. 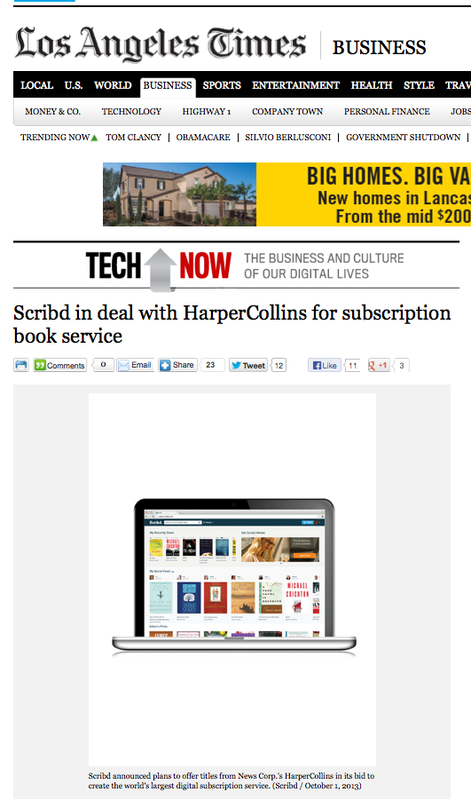 E-Books Via Subscription... Would You Sign Up? The idea is that people pay a monthly amount to watch movies on Netflix, so maybe they'll pay a monthly amount to read ebooks from, among other publishers, HarperCollins. How it works: Scribd will charge $8.99 a month for the service, which will offer unlimited access to titles published before July 2012. It will also offer books from smaller publishers. HarperCollins and authors will get a cut of each book read. It's not clear whether the monthly fees will be enough to make up for lower sales of printed books. Would you sign up? Is this a "good thing" for authors and illustrators? It will be fascinating to see what happens as our industry moves into the future! 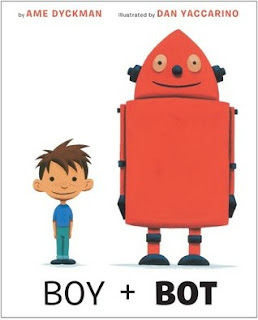 The 2013 Crystal Kite Award for the USA Atlantic Region (Pennsylvania, Delaware, New Jersey, Washington, D.C., Virginia, West Virginia and Maryland) goes to Ame Dyckman for her picture book, "BOY + BOT!" Crystal Kite Winner Ame Dyckman! "BOY + BOT" was published by Alfred A. Knopf (Random House Children's Books) and illustrated by Dan Yaccarino. Lee: Tell us about your book! Ame: BOY + BOT (illustrated by the amazing Dan Yaccarino) is a funny and sweet friendship-despite-differences story between a boy and a robot. They meet in the woods and have a terrific time playing--until Bot bumps his power switch and is turned off! Worried that his new friend is sick, Boy brings Bot home in his wagon and tries all the remedies he knows (applesauce, a story, and tucking him in). But when Bot is reactivated after Boy has fallen asleep, it's Bot's turn to help his "malfunctioning" friend! Ame: I wouldn't be published without SCBWI! When I joined my local SCBWI chapter (YAY, NJ SCBWI!) five years ago, I had the love of kidlit in my heart--but absolutely no idea how to write it! But thanks to all the fantastic regional and national SCBWI events in our area, I had lots of opportunities to listen, learn, and practice my writing. Four years ago I participated in the Agent Pitch Session at the NJ SCBWI Annual Conference, Super Agent Scott Treimel offered me representation, and BOY + BOT was on its way! Since then, Scott has sold three more of my books, and I knew I'd love working with my editors because I'd already met them through SCBWI! 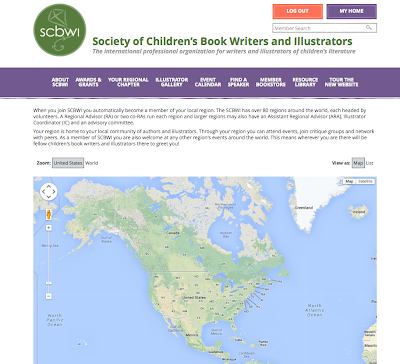 Ame: If you haven't yet, get involved with your local SCBWI chapter! You'll learn tons, have SO much fun, and SCBWI WORKS! I remember when I first met Ame at a mentoring workshop in the NJ chapter. We were in a peer group together. She was super friendly, enthusiastic, kind and honest with her critiques and everyone could tell she had a natural passion for children's books. Ame worked hard, stayed true to her self and her craft, and stuck at it, and now she has all these amazing books along with awards, including the Crystal Kite. During the time I have known Ame, and even now with her busy schedule, she's always been involved with the chapter giving support and helping out in any way she can, and she does it wholeheartedly without complaint or for anything in return. Roles have included workshop facilitator, volunteer coordinator at past annual conferences, organizing first page sessions, presenter, mentor, and much more! We're all thrilled for Ame and winning the Crystal Kite Award and wish her many more in the future. It's awesome and much deserved! 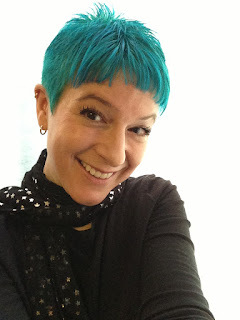 You can find out more about Ame and her books at her website here, and on Twitter @AmeDyckman where she posts "picture book reviews and a good deal of whatever pops into my head. ;)"
The chapter comprises of approximately 700 members, published and to-be published. We have an RA, ARA and IC as well as a wonderful and dedicated committee of 14 people plus an amazing host of volunteers who step up to help when we need them. The New Jersey chapter offers members a variety of events throughout the year. Its been a busy year for us! 2013 has been about trying some new ideas such: as a meditation workshop with writing/ illustration exercises to help you overcome blocks or obstacles; a portfolio development day with industry mentors; Ame Dyckman gave her Picture Book Word Count Smackdown workshop to rave reviews; we hosted a Free PIBoIdMo and NaNoWriMo kickoff night this week in three locations around the state. There's free kidlit socials, evenings with industry professionals, and we have our Fall Craft weekend coming up in November which is jam-packed with workshops, editor/agent one-on-ones, first-page sessions, illustrator track and more. Our annual summer conference was held in June which ran for two-and-a-half days and included genre-specific intensives, critiques, nearly 80 workshop sessions, industry panels, a bookfair, and two wonderful presentations from our keynotes: Peter Brown and Lauren Oliver. I'm excited about the year ahead and hope we can continue to bring more events like this to our members. We have some great ideas planned for PAL members too! 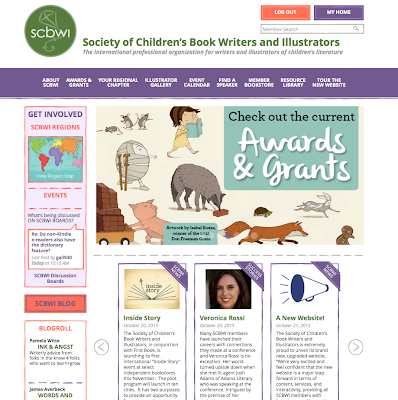 Learn more about SCBWI New Jersey at their website here. Thanks to Ame and Leeza, and cheers to Ame for her Crystal Kite Award for "BOY + BOT!" They're both funny. 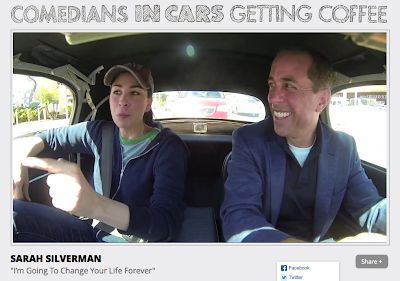 But what really jumped out at me is Sarah's quick sketches of her parents, at around 3:25 in. It's only one minute long - a couple of sentences to describe each parent, but we learn SO much about Sarah's dad and mom, her childhood, and we get a lot of insight into who Sarah is, too. As we create our characters, it's inspiring to recognize how much you can convey so quickly.